An 87th minute header from substitute Fiona Mearns helped St. Johnstone earn a point as a frantic last fifteen minutes rounded off what had been up until that point a fairly tame Scottish Building Society SWPL 2 encounter at Oriam in Edinburgh. 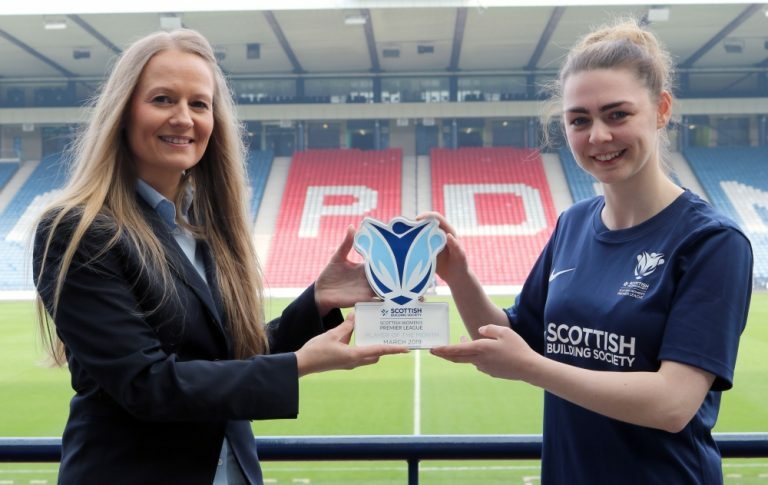 It was St. Johnstone who had the first attempts on goal as two long range efforts from midifielder Jade McDonald failed to trouble Emily Mutch in the Hearts goal but gave an early indication that chances would be a at a premium throughout the early stages of this match. St. Johnstone continued to shoot form range without much effect as the half continued whilst Hearts’ main threat came from a series of through balls that lively striker Lauren Evans couldn’t quite get on the end of although a Hearts effort on the half hour did call Saints keeper Rebecca Cameron into action. The best passage of play in the first period came from the visitors. Some intricate play around the edge of the box between Hannah Clark, Ellie-May Cowie and Nicole Carter ended with Clark diverting a shot towards goal that Mutch did well to get down to her left and keep hold of. It was a much needed piece of action to help rouse a healthy crowd in attendance at Oriam. Despite the home sides earlier possession advantage it was St. Johnstone who ended the half stronger and a neat corner kick routine saw Rachel Todd turn the ball just wide of Mutch’s near post. It looked as if the game was heading for a stalemate but Evans was not to be denied and on the 82nd minute she put the home side ahead. A lobbed ball through from midfielder Rachel Walkingshaw put the striker into the danger area but she still had plenty to do outmuscling and then skipping past both a Saints defender and the goalkeeper before tucking the ball in at the near post with the defence scrambling. It seemed a just reward for Hearts’ more adventurous second half display but just five minutes later Mearns rose highest to get on the end of a right wing corner to scramble home a equaliser and with time ticking down it looked like it might be the visitors who would sneak an unlikely victory. It wasn’t to be though and a point was enough to keep the Jambos top of the SBSSWPL 2 pile come the end of the day.